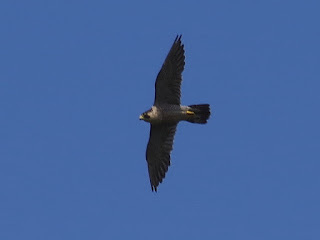 A Peregrine circled high over Buck Hill before heading off in the direction of the Metropole Hilton in the Edgware Road, the pair's usual day roost. 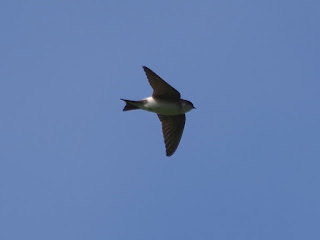 A flock of House Martins flying over the hill didn't seem to be worried by it, neither flying away nor mobbing it. A raptor that can take down a pigeon might consider them too small to be woth catching. 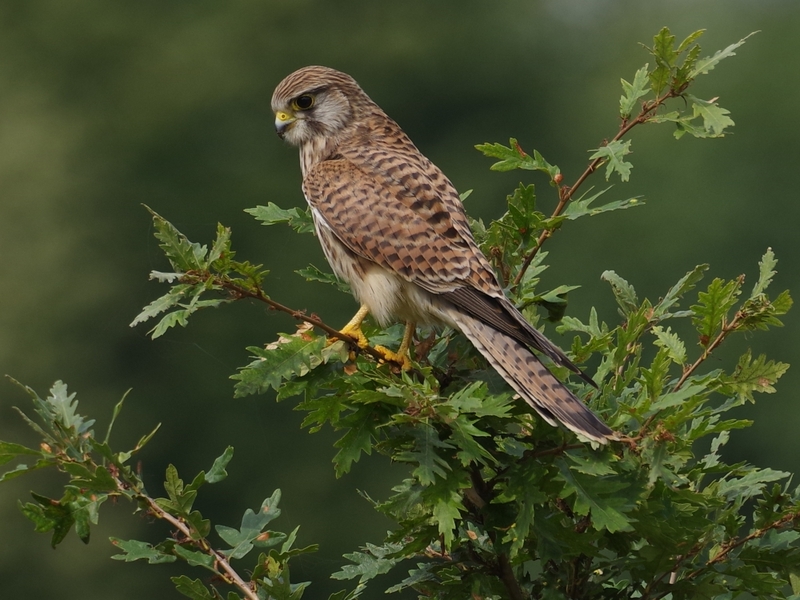 The female Kestrel arrived afterwards and perched in a little oak sapling. 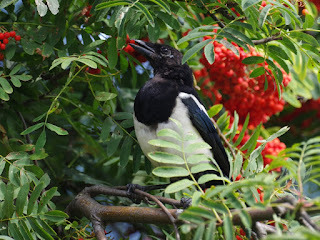 At the other end of the hill, the only visitor to the rowan trees was a Magpie. The air ambulance service uses Buck Hill as a pickup point for casualties needing urgent attention, such as people with spinal injuries being flown to Stoke Mandeville Hospital. The unusual helicopter with no tail rotor is an MD 902 Explorer. The thrust required to keep the fuselage from spinning in the opposite direction to the main rotor is provided by a fan inside the tail boom blowing out air sideways at the tip. It makes the helicopter a lot quieter than a normal one. The birds on Buck Hill are used to this visitor, and carry on as normal when it arrives. 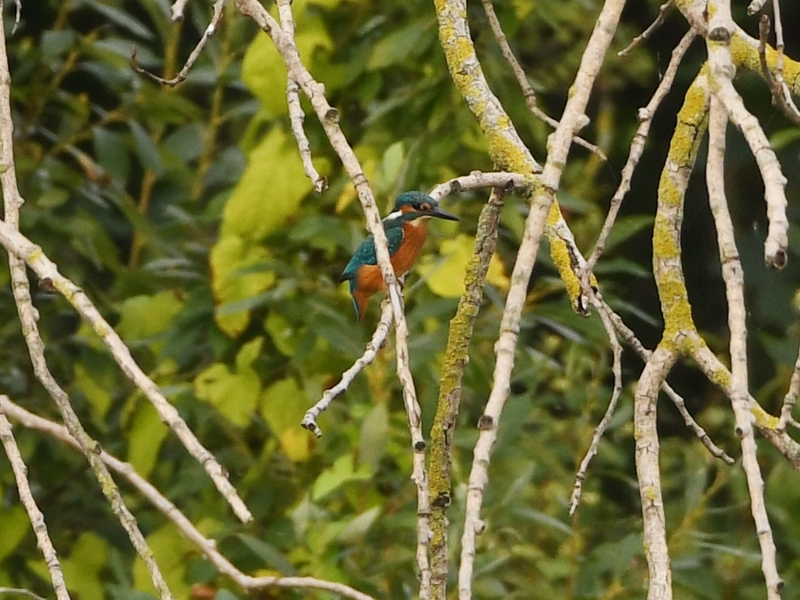 Tom saw a Kingfisher on the Long Water, in the fallen poplar tree at the Vista. 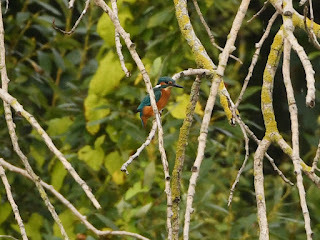 This is the first sighting of a Kingfisher here for several months. Here's his picture, taken from across the lake. 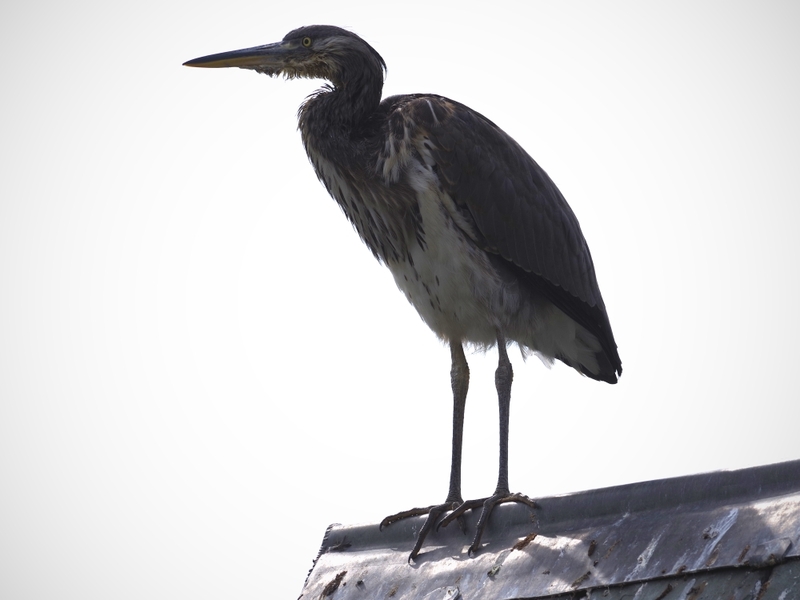 One of the young Grey Herons perched on the ridge of a boathouse roof. They have already got their flying skills well adjusted, though I haven't yet seen one land on a slender branch as the adults can. The other was fishing on the shore of the island. The Great Crested Grebes at the island were putting weed on the Coots' nest as if they meant to use it themselves. I don't think they are serious about this. 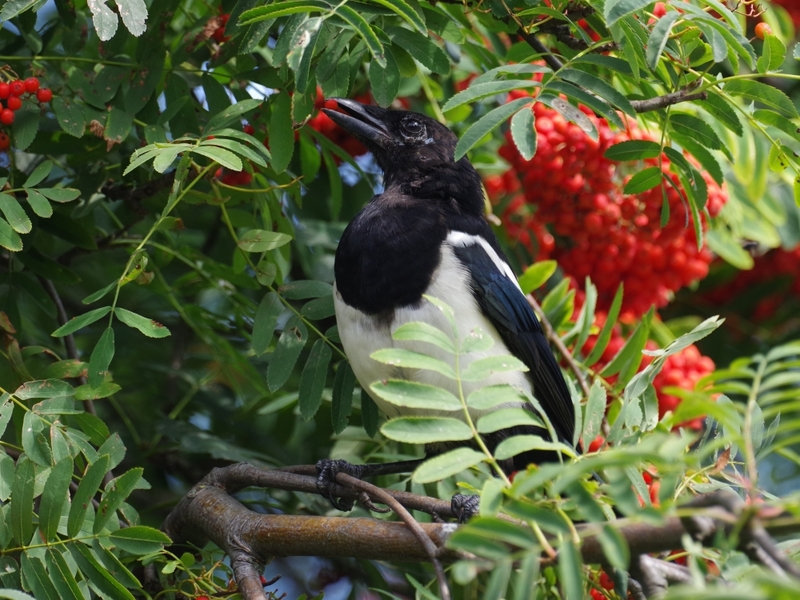 They have two quite young chicks to look after, and if they really wanted the nest they would pull the top twigs off to reduce it to a comfortable height for them. 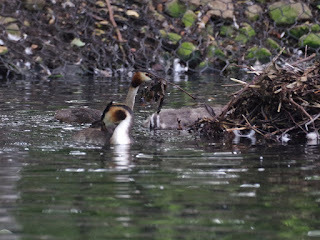 Nevertheless, a pair of grebes once started a successful nest on the Serpentine as late as 1 September. 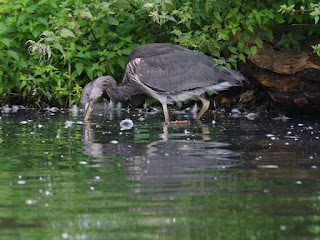 A grebe with plenty of time to spare alternately preened and looked below the surface to see if any fish were passing. 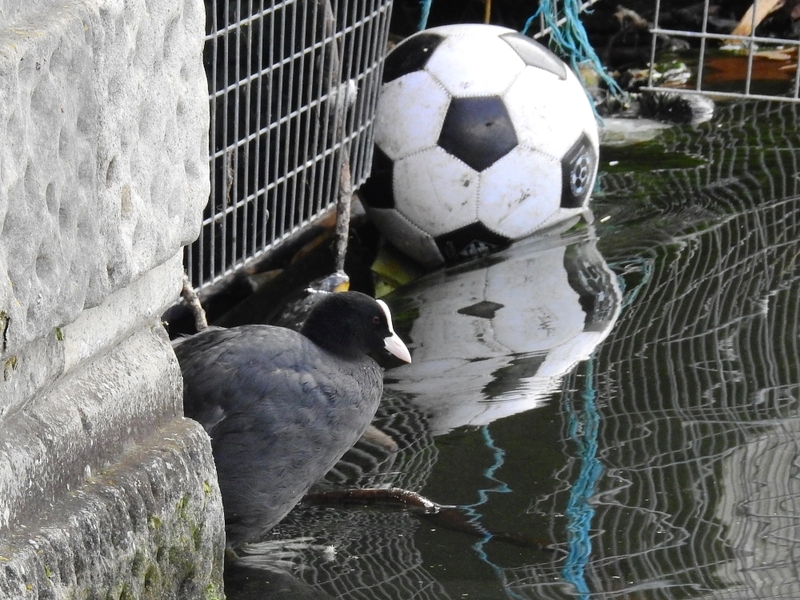 The Coots' nest site at the Serpentine outflow now has a football at the top of the weir, held there by the current. It blocks the plank that the Coots climb up and down to get to their chicks at the lower level, but the Coots are strong enough to push it aside if they want to. A Moorhen lost patience with two chicks clamouring for food and shooed them away, without much effect. 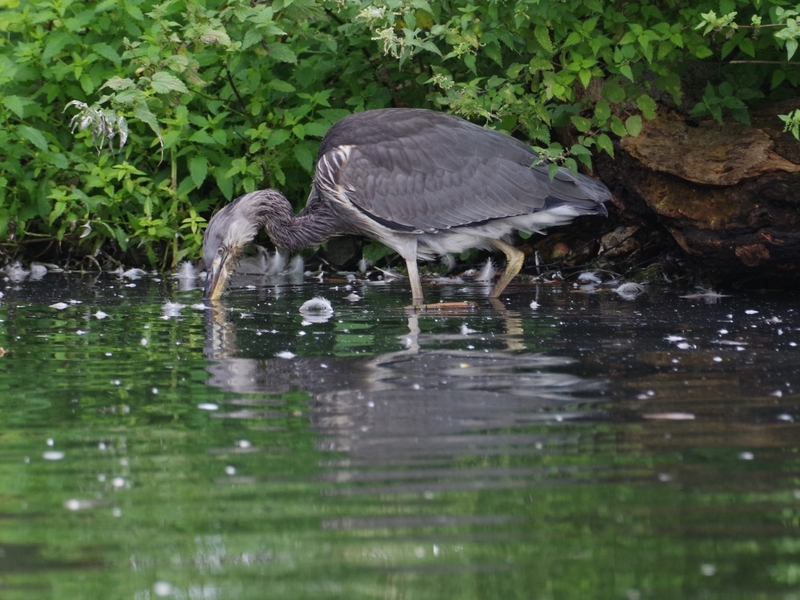 At this age the chicks are already quite good at finding their own food. 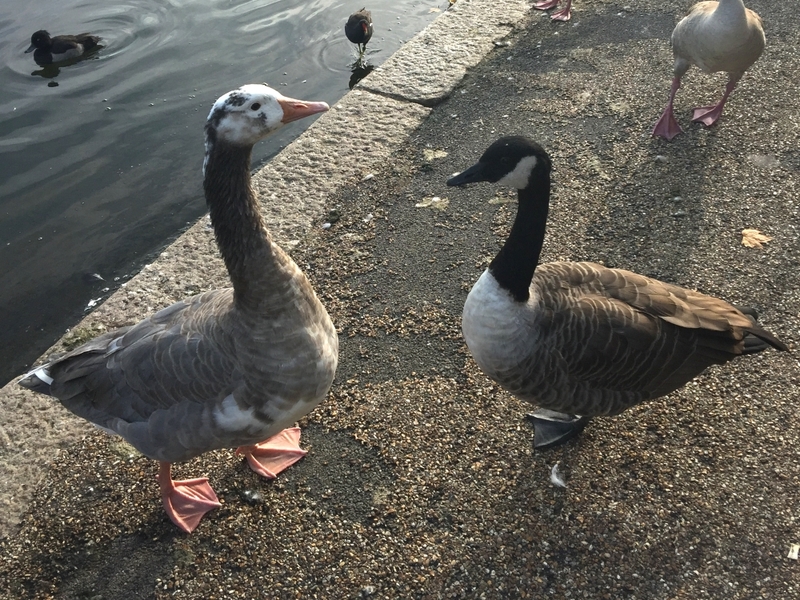 The enormous Greylag Goose on the Serpentine seems to have a Canada mate. It's considerably larger, as this photograph by Abigail shows. Jon Ferguson has been keeping an eye on the remarkably successful Mallard family on the Round Pond, and sent two pictures. 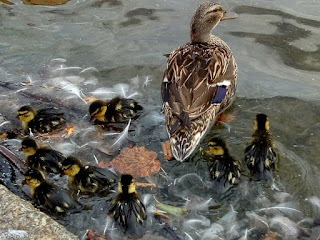 On 30 July there were eight small ducklings. 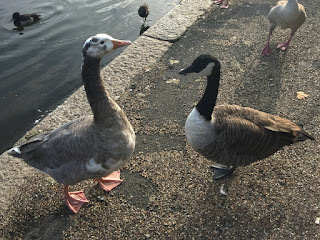 On 29 August there were still seven, a remarkable feat on an an open pond with no cover, patrolled by large hungry gulls. It's good the Mallard brood have been successful in unlikely circumstances. Nice shot of the Peregrine! For no clear reason, it's been a very good year for ducks. About time they got a break. The vast increase in the population of Herring Gulls has been very hard for them. Lovely shot of the kestrel too, and thanks for showing me where it's likely to be spotted - as well as how to use my exposure compensation facility, which is much simpler than I expected. I was thrilled to see the kestrel and I can now take better photos so it was a very worthwhile visit! 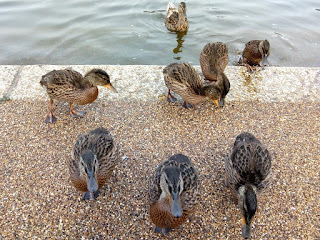 Bird parents all over the Park seem to be on a very short fuse with their annoying begging children! The year is passing and it's time to kick the little dears out.